Using your smartphone? Consider switching to Theme Exodus! The animation makes curious. There appears to be a straight line on the NW side of the water area, whereas the north east and east south sides show a jagged pattern. What is the theory of the straight line? The water current in Kane Basin and Smith Sound is stronger on the Canadian side. (On the Greenland side, there is some north-bound current). I think, therefore, water (and abrasive ice chunks) scour the west side of Nares Strait. The fast ice on the 'chunky' north and east sides breaks where it may, often between and around frozen-in floes, and nothing challenges its ruggedness. Arctic ice is healthy for children and other living things. And in addition to what Tor has just said, the fast ice on the Canadian side gets some much needed shelter in the lee of the two promontories (marked). Bearing in mind that the current is moving NE to SW on that side. Moving quite fast too. Look at today's image and see how far the chunk has moved down the strait. The original arch to the north is visible too in this image. After 21 March, there has been very little movement at all right up through the Nares Strait north of the arch and in the Lincoln Sea. The attached GIF of the Lincoln Sea runs through from March 21 to March 26. Suggests that the arches in Nares and the Garlic Press are not holding over the winter. In general I think it is important for posterity to cross-post the animations and images in this thread to the general Nares thread, which can later serve as an excellent historical resource. I agree. I had posted two animations in the other poll-type-Nares threads and am posting them now here for posterity. Not sure if it is significant but just noticed a gap in the ice opened up at the North end. Ice flows make nice floes but icebergs don't make nice burgers. Windytv has been forecasting winds out of the south for several days (at least), so I am not surprised by the arch holding in the southern Kane basin while ice breaks up all along the upper parts of the strait. Interesting. Note the gap opened due to ice transport. It's a combination of two things - breakage of the ice in the Lincoln Sea, and reversal of the prevailing wind. Typically the wind in the strait goes from northeast to southwest, along with the almost-constant water flow. But currently it is blowing from southwest to northeast, as shown on WindyTV. A little wear and tear, but holding yesterday. A very clear image of Kane Basin. The arch is still holding nicely, with the original arch very visible behind. Melt-water on the fast ice around the basin gives a clue about the weather. Hans Island weather station (in Kennedy channel north of the Basin) gives another clue. Normally the arch should go in a couple of weeks, though it seems rather stable. We'll know when the time comes. Since it is nearly 21st(my guess), here is a worldview animation from may 29-jun18. Another animation, up to June 24th. The "new" arch is being eaten slowly but the end is not yet in sight. I do notice that a support of the original arch broke on the northwest side. It could yet go within the month though a first half of July finish is more probable. I find it amazing how open part of Nares Strait is, given the blockage in Kane Basin. Snagged from yesterday's Worldview image. I think it's often like that at this time of year, though not sure of the exact mechanism. Maybe the strong southbound current increases bottom melt beyond normal rates, and together with air temps above zero causes the thinnest ice to disappear, and then the current sweeps the thicker ice south leaving a polynia in the northern part. The north west side does look weaker. Windy ecmwf forecast temperatures above zero for the next two days with up to 60km/h gusts. For actual and detailed weather measurements in the strait itself, there's my favorite weather station on Hans Island, a bit to the north in the Kennedy Channel. In the last 48 hours temps have indeed been above zero more often than not. Yes, judging by the cracks it looks like the ice is about to disintegrate all the way up to the top of the channel. The Lincoln sea ice is already funnelling into the gap left further up the channel. With the collapse of the arch this should continue. The Lincoln sea ice is already funnelling into the gap left further up the channel. In that last image the angle of those cracks suggest that the entire mass of ice in the strait has slipped slightly towards the open water. And with the prevalent bluing throughout the image, there is a whole lot of melt going on. Would not be surprised if it gives way soon and, when it does, the disintegration will be quick as all of those tiny flows will break free from each other. Nares Strait looks distinctly like a champange bottle in the process of popping, with the build up of pressure from behind and I think when it does, it will quite spectacularly. The photo taken on 30 July June shows the arch had already broken. Today the wind shifted to northerly, driving the mass of ice southwards. The photo taken on 30 July shows the arch had already broken. Today the wind shifted to northerly, driving the mass of ice southwards. Knowledge, Understanding & Insight Are Among The Best Sources For Personal Freedom & Vitality ! Maybe this will create some more ice to flush trough the Nares Strait. In the good old days, we could watch many distinctive floes enter the north end of Nares Strait and watch them exit Smith Sound 5 or 30 days later, somewhat beaten, perhaps, but readily trackable. This year, it nearly all looks like garbage, at both ends and in the middle. I believe it was last year that took 'forever' to see an identifiable floe go the length - so much melted or got pulverized along the way (and it wasn't in a hurry to go south). I wouldn't dare start a poll this year as very few hunks of ice look like they might make it all the way (and remain recognizable day by day). In the center of the attached screen shot (DMI Sentinel 2018-07-05) is a small floe that looks pretty robust (and with nearly square corners - I'll call it "Cub Scout" as [when I was one] our pledge was to be "square"). Will it make it? Currently, it is in Hall Basin, at the intersection of lines running down Petermann Fjord and following the ridge that ends at Ellesmere Island's Cape Baird. Although distinctive today, I cannot find it in yesterday's Sentinel image, although I found a 'neighbor' that traveled about 15 km in one day. The next few days should see the north end of nares open pretty far into lincoln sea. Warmish temps and consistent wind will likely move the ice north. This movement already begun over the last 24 hours and should increase with higher winds and higher temps since the ice pack in lincoln already appears to be fairly mobile. 2007 - No arches formed. 2009 - No southern arch. Northern arch broke around June 30th. 2017 - No southern arch. Northern arch broke around May 10th. A small list like this one, is so incredibly valuable. The Lincoln polynya is opening up, but not through the normal mechanism of a bridge holding back flow down Nares. Over the last few days there has been a prevailing SW wind up Nares Strait, which is pushing back the ice in the Lincoln Sea. The polynya has reached around 2500 km^2 (50km x 50km). This implies to me that the ice in the Lincoln Sea is very fractured. In past years I've seen it easily hold a bridge. This year, when flow was down the Strait after the bridge broke, fracture lines were evident far out into the Lincoln Sea. Now, that fractured ice is not holding. 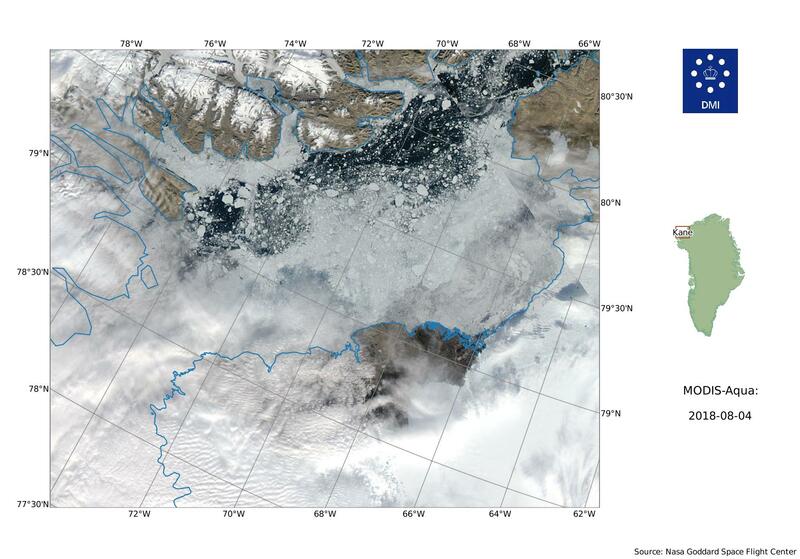 It's possible to see signs of melting in the polynya - at NASA Worldview. There appear to be trailing melt from the floes and the edge of the ice is very smooth implying wave action is melting this. On the 9th the wind was 44 km/h at 3 degrees C.
The forecast for the next 5 days on Nullschool is continuing winds from this direction and temperatures above freezing, so this should continue to grow. The wind has been blowing the Kane Basin ice 'up stream' (northeastward) and the Smith Sound ice northward for the past week or so. GIF prepared from DMI Sentinel images from July 9, 11 and 14 (dates are on gif). Two floes are roughly outlined to make it easier for you to following the motion. According to Windy.com, forecast winds are mixed north and south (back and forth) this next week. I normally follow it (rather crudely) using the AMSR2 animations posted on the melting season thread. Indeed it seems that in the last few days southward movement through the strait has resumed, after quite a while of reverse moves. Looks like the 'plug' at Kane has finally broken up and there is a southward flow. The loose ice in the north should start to flush out. Nares Strait continues to be fed ice by the Lincoln Sea. ["Here, Little Nares, have a mouthful of ice. It's good for you. And don't worry, there's more from where this comes from."] Images from DMI Sentinel for Nov. 7 and 8. Perhaps this belongs in stupid questions but, would the saltier water cause any weakening of the ice above it if in direct contact? While the Nares Strait is open I think the export is largely due to the strong current. The similarity of the ice fracture area with the salinity model suggests that salty water from below may be part of the process. If so, it is likely to be warmer, which could cause weakening. Worldview, viirs brightness temperature, band15n animation of Nares, nov3-12. polarview, nov22. Polynya area a bit larger. Oscillating ice at the north end of the Kane basin. Still quite clear over the Nares/Lincoln sea so a continuation of Worldview, viirs brightness temperature, band15n animation, nov14-28. Arches keep forming and collapsing. Page created in 0.056 seconds with 28 queries.